Phragmites have round, hollow stems with a seed head at the end of the stem. Phragmites (also known as Common Reed) is a cane-like grass that grows from 12 to 16 feet tall, forming dense stands. Its stems are round and hollow with flat leaves along the length of the stem. The leaves are long (up to 24 inches by 2 inches wide) and gradually taper to a point. The seed head is at the end of the stem and is multi-branched, 8 to 16 inches long. Silky hairs along the flowers axis give it a silky appearance. Blooms are purple or gray and fluffy. They are widely distributed throughout the United States and on all continents except Antarctica. Common Reed is native to Costa Rica. They thrive in deep and shallow freshwater marshes. 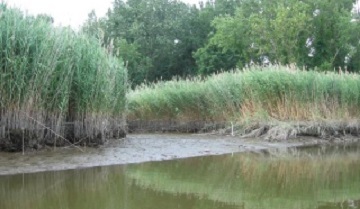 Glyphosate 5.4 and a surfactant is a great way to treat Phragmites. Lake Restoration carries these products. You can learn more or purchase these products on our website.